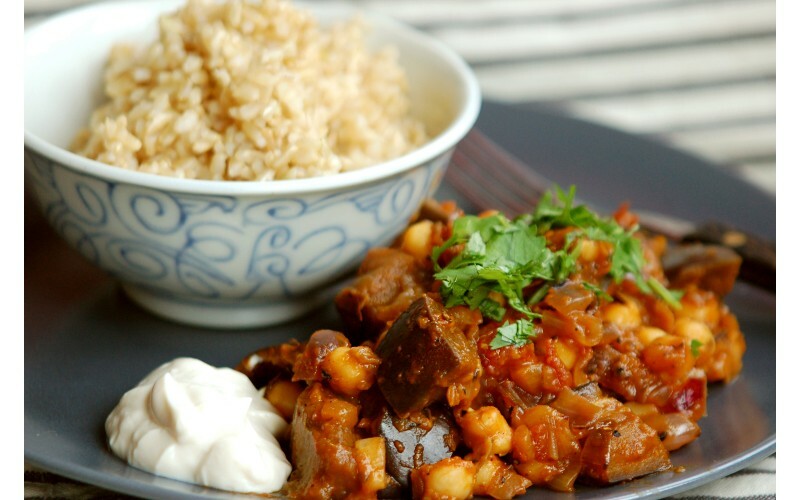 This lovely tangy curry is very easy to make and one of the most popular dishes on the website. Most of the preparation can be done while the aubergine cubes soak. We've given serving suggestions below. However, the easiest way to boost protein and make it a more substantial dish is to add 1 tin of rinsed and drained chickpeas about 5 minutes before the end (or 240g home-cooked). Cut aubergines into medium-small cubes - around 2cm/1 inch - and soak in cold water for about 10 minutes. You can prepare the rest of the dish during this time. Heat oil and fry spices for 2 minutes. Add tomatoes, salt and drained aubergines. Stir for five minutes, add lemon juice, cover and cook slowly until the aubergine is tender, stirring occasionally. Add the chickpeas if using and cook in for a minute or two before serving. Stir in the chopped coriander and serve hot.